Behaviorists can debate the influences of nature versus nurture, but for a Portland, Oregon, mental health clinic, nature is nurture. Biophilic principles permeate Old Town Recovery Center (OTRC), the winner of the Ambulatory Care Facilities category of the Healthcare Environment Awards. Run by local nonprofit Central City Concern (CCC), the center is an extension of the organization’s Old Town Clinic, which provides outpatient primary and holistic care and educational programs for the homeless and low-income, mentally-ill population of the city. To create this urban sanctuary, CCC turned to SERA Architects, who had previously designed Old Town Clinic and was therefore familiar with the type of healing environment CCC desired. Instead of moving to a new location to expand, the client took over the lot adjacent to Old Town Clinic, on which an abandoned fast-food restaurant stood, and built a three-story structure with direct access to the existing clinic. 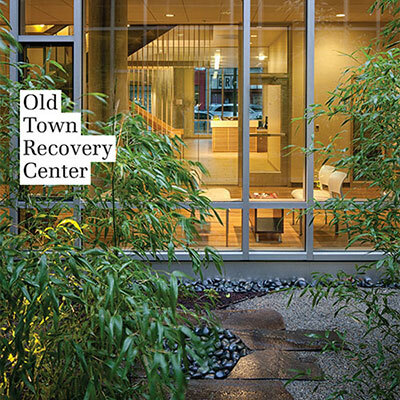 Old Town Recovery Center successfully departs from the traditional sterile healthcare facility, instead embracing an aesthetic akin to a holistic wellness center. “All these institutional projects suffer from artificial products. We were trying to get as many natural materials in to make things warmer and tactile,” explains Paul Jeffreys, AIA, RIBA, principal in charge at SERA Architects. Patients, staff, and visitors witness this difference upon entering the main lobby, where wood elements impart a welcoming atmosphere. A slatted-maple reception desk greets visitors, and just beyond a central staircase sports maple handrails, balustrade, treads, and risers. Open underneath and glass-walled on one side, the staircase and its slatted balustrade allow glimpses of lush greenery. An open-air courtyard is a visible oasis central to the OTRC design intent: Outfitted with bamboo and river rocks, the courtyard has a calming effect. All three floors look into this space, but in areas that don’t have a courtyard view, windows provide views out to tree-lined streets. “SERA worked with us to explore how bringing the outdoors in can add to a client’s sense of comfort,” says Sean Hubert, senior director of housing for CCC. Biophilic design may have been a factor in incorporating nature into the project, but it wasn’t the sole reason. Based in one of the most environmentally conscientious cities in the United States, SERA was mindful of sustainable issues. The architects developed their own thermally broken wall system for the building’s envelope to reduce loads, and specified energy-smart machinery and systems such as daylight responsive controls and exhaust-air heat recovery equipment. The wood used throughout the project was sourced from local, FSC-certified forests, and all other materials and interior products were locally or regionally sourced. Toxic finishes were avoided wherever possible to ensure healthy indoor air quality. And a 14,000-gallon tank was installed to collect rainwater for non-potable use. To accommodate an estimated 80,000 visits a year with a unique blend of primary and holistic care, CCC commissioned the new ground-up construction as an expansion of its existing clinic. This enabled the clinic to focus on all primary care procedures. The program for OTRC required additional treatment rooms for counseling and acupuncture, and community spaces that are vital to the nonprofit’s goals of aiding patients in attaining normal lives. For instance, a yoga studio hosts classes and low-impact exercise to balance both mind and body, while a space dubbed the Living Room features lounge seating, an open kitchen, and even showers and laundry machines, all meant for patients to develop social and homemaking skills. SERA also designed a concept for a future addition of 120 low-income housing units to be built on top of the treatment facility. Since OTRC would essentially become the base of the housing structure, the design team kept the exteriors simple and modern, and reinforced OTRC’s roof to support the proposed building’s weight. Not yet funded or approved, the residential portion required careful planning nevertheless to take into account issues such as which systems could be shared between OTRC and the addition, and how construction could be accommodated.